There are some places on earth that makes you instantly feel good and for me, Iceland is one of those places. So when came up the opportunity to return there for the third time, I didn’t think twice and book those plane tickets. 10 days later I was landing in Reykjavik. Even if I’d been there twice, this third trip was really special for two reasons. 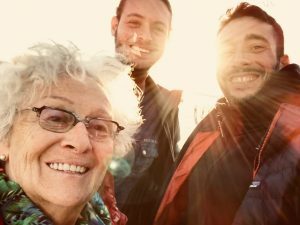 First, my young cousin and I took our 82 years old grandma on a road trip she would never dream of. The second reason was that I never shot film there before. During my two previous trips, I was still a digital boy and had zero interest in film at the time, but this third visit was so special. It’s not everyday that you share such a trip with your grandma and cousin, so film was the obvious choice to capture those memories. Eventually, my trusty Hasselblad Xpan for 35mm and Mamiya 7 for 120 film were the chosen ones. Then came the choice of film stock. The weather in Iceland can be quite unpredictable, even in August, so wasn’t sure what to bring but I settled on Fujifilm Velvia for colour (see my review here) and Street Candy ATM400 for black and white on the Xpan. As for BW on 120, I picked a roll of Ilford HP5 and will show you below how it looks compared to ATM400. Even if it’s meant to be in the streets, thanks to its high contrast, I wanted to test out the ATM400 with the beautiful pallet of landscapes Iceland has to offer. We started our 7 days road trip from Reykjavik all the way to Djupivogur on the east coast and then back to the capital. Along the way, I shot 2 rolls of Street Candy on the Xpan and picked my favorite pictures to show you. This first one above is the one I’m the most proud of. On top of being a great family souvenir with my cousin and grandma holding each other, I really love all the tonalities of greys in this picture! This was shot late in the morning with the sun on our back and a giant softbox right above the head with all those high clouds. Then we kept driving and got to a first glacier called “Sveitarfélagið Hornafjörður”(good luck with that!). It was later in the afternoon and the cloud layer got thicker and lowered than in the morning, which made it a little more challenging for my Xpan to meter. The few pictures see a little underexposed to me. The dark ashes and lava soil also didn’t help at getting more information in the shadows. As we drove deeper into the glacier, it got even worse with the dark ground so instead of shooting in Aperture Priority, I switched to Manual mode and measured the light on the palm of my hand, as the Xpan’s meter would have had a hard time seeing the small off-center grandma. It didn’t turn out exactly like what I had in mind, and I suspect that the dark surroundings absorbed most of the ambient light and didn’t bounced it back on her. Last shot of the day was another favorite from this trip. When driving in Iceland, expect to see this kind of scene every 5 minutes. The good thing is that you can pull on the roadside almost everywhere without any risk and get shots like this easily. The next series was taken at the beach right in front of the Jokularson glacier. This place is know for having pieces of ice washed back on the shore after breaking from the glacier. Unfortunately, there wasn’t much ice on the beach compared to my previous trips but still enough to impress those two! 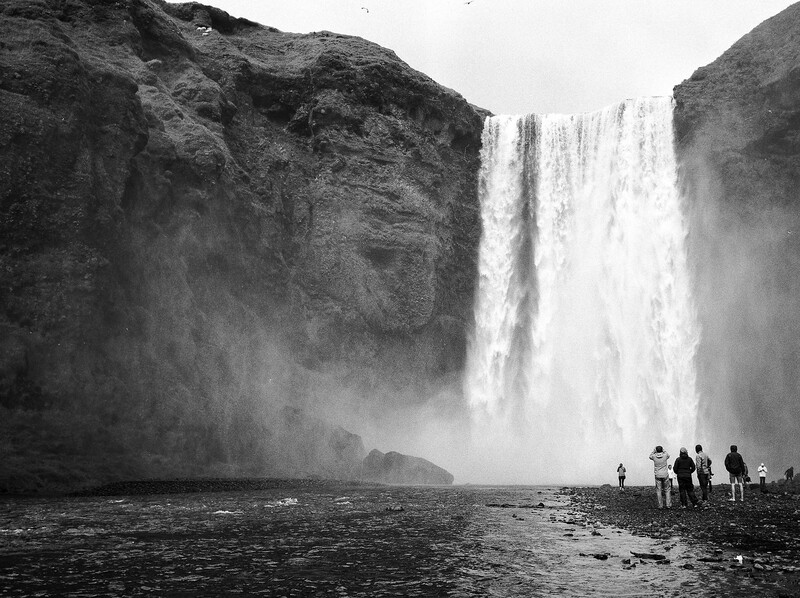 To conclude, I kept this last picture shot at Skógafoss waterfall to show you how Street Candy ATM400 holds versus Ilford HP5 (shot on Mamiya 7). Sorry I only have these two from the same place to compare but it gives a first idea. Here’s another side by side with Street Candy on left and HP5 on the right. The difference isn’t as strong as I would have expected but to be a fair comparison, I should repeat the experience with the same camera and lens. This can also be explained by the fact that ATM400 and HP5 share the same development process. Hope you enjoyed this quick look at Street Candy ATM400 and that you will give it a chance in case you haven’t yet. Visit streetcandyfilm.com to get more information and find where to buy a few rolls. I’ll wrap this up by thanking again my lab Nation Photo for processing and scanning these rolls for me. 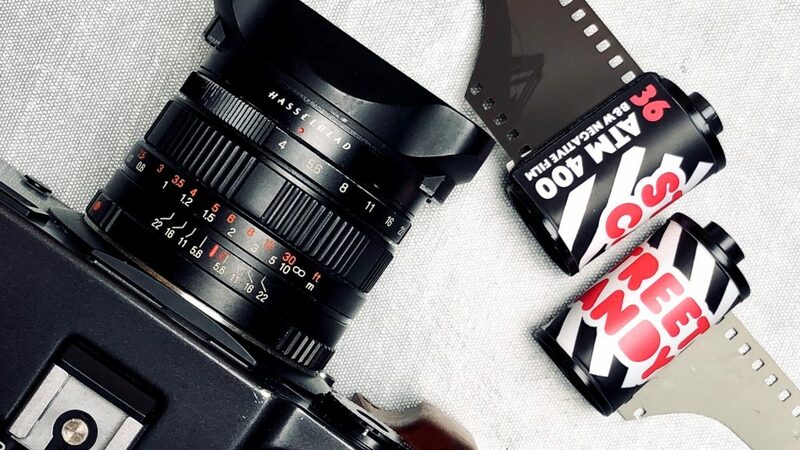 If you are looking for a place to get film supply or lab services, make sure to check them out.